There has been quite a bit going on in the shop the past few weeks. I have wrapped up a couple of projects and have started a few new ones as well. Among these are a black walnut desk, some butcher block style countertops, and numerous new jigs and tools to make my work easier; however more notably I have began construction on a new archtop solid body. It has some of the design characteristics of a PRS, but is a little more edgy and aggressive looking. It’s got a black walnut/maple body, and the carved top is from buckeye burl. My fiancé came up with the name Hell Cat, and seemed fitting for the aggressive body style with the crazy buckeye top. 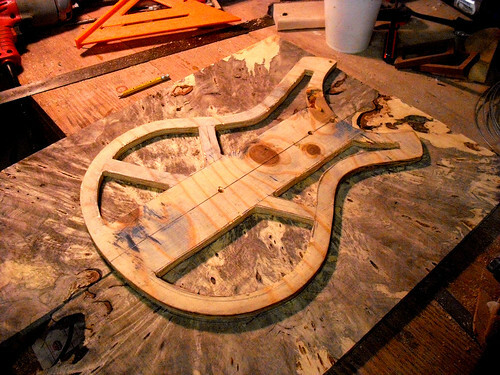 the body has walnut wings, with a center beam of maple this will give it some tonal variety. here is the buckeye burl that will grace the top of this guitar, absolutely stunning figure in this peice. clamping this one was a pain, the burl was so dry that it curled almost instantly when coming in contact with the glue, made it tricky to glue up. 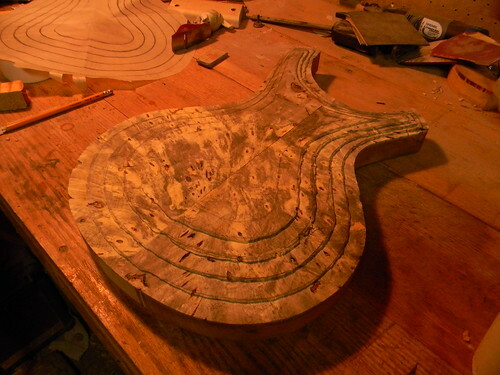 here is the first step in carving the top, i smooth out those stair steps to acieve the desired contour. 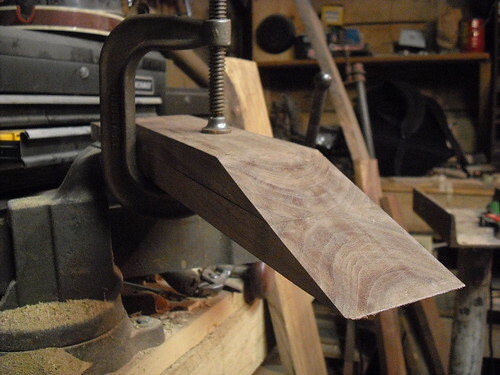 here is the scarf joint for the neck, it is also black walnut and has some very beautiful figure in it as well. Hello there and welcome. My name is Shad Peters. I’m 21 years old, a student at BSU in Muncie IN and I’m the craftsman behind Peters Instruments, my hobby turned business. As one might guess, I deal with instruments—mainly building them, but I do some repairs as well. Primarily I make electric guitars, but I have also made banjos and have a strong desire to start exploring archtop guitars, steel strings, and mandolins too. 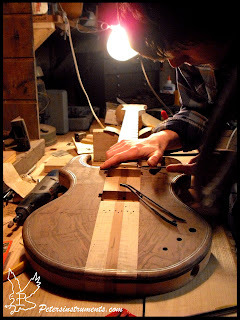 My intention for this blog is to document the building process for some of my instruments, detail some of the finer points of the work that I do, and show what happens in the shop on a day to day basis. Hopefully in doing so, I’ll connect with other luthiers, woodworkers, and anyone else—craftsman or not—who may be interested in the work that I do. I am here to share what knowledge I have as well as learn from others who want to contribute. I often get asked how I got started building guitars so I think now might be a good time to get that question out of the way. 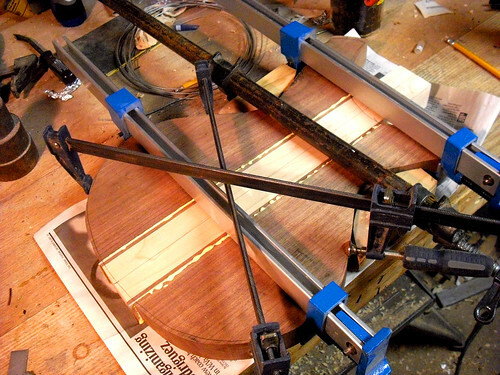 An equally important question is why I started building guitars and the answer goes hand in hand with how. I started building guitars as a sophomore in high school. I was 15. At that time I really wanted a new electric guitar but I couldn’t afford to buy anything nice. In addition I found that the guitars that I was interested in—the guitars that I daydreamed about in math class and doodled in my history notes—were not available. In fact, they did not actually exist. For over 50 years the industry had been churning out guitars standardized by the early designs of Fender and Gibson. Here my frustrations manifested: there were different names, but there weren't different guitars. I wanted something new, inspired, and unique ­­–­ something with improved playability and a modern twist on classic elements. 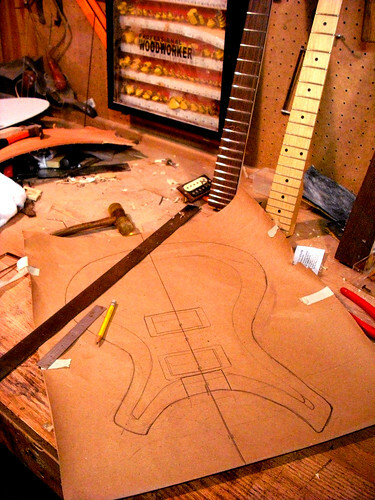 In the end I was resolved that the only way to see guitars that I thought should be available was to make them myself; hence I began work on my first guitar. That was a period with a lot of experimentation and a steep learning curve. Back then I didn’t have access to a lot of resources that are available now, and I didn’t have reliable internet where I grew up out in the boonies. I made do with very little literature as well. I started with a chunk of old growth maple, which I had salvaged from a friend’s barn. 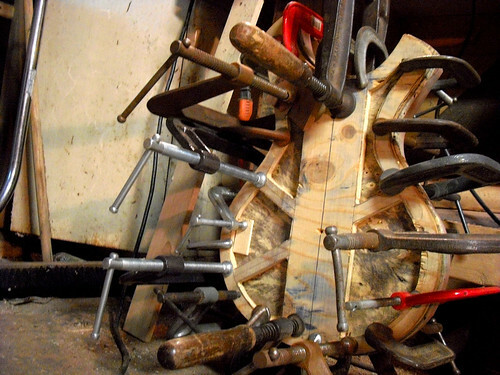 It was well over 100 years old and the whole guitar came from a single board. That’s where I started; in the years since then I have continued to learn and grow as a craftsman, but the philosophies that got me started are still the driving force behind what I do. My aim is to offer a superior alternative to the cookie-cutter instruments that flood the market, for others like me who believe that there is something better to be had.